Braaied rack of lamb, herbed brinjals and dhai. The partnership of roast lamb and mint sauce is hotly debated by many meat- and wine-lovers, as the vinegary sauce has a tendency to dominate the meat and usurp even the most robust red wine. A natural global fusion moves things up a notch in this alluring meal of perfectly cooked lamb racks with sidekicks of yoghurt and brinjals, all generously flavoured with herbs. Despite Mediterranean cooks clasping brinjals to their own culinary bosom, these originated in Asia, and their voluptuous earthiness and full, rich flavour inspired a variety of names. Britain adopted the French aubergine, a name with origins in Sanskrit vatin-ganah (anti-flatulence vegetable), through Persian badin-gan, Arabic al-badinjan and Catalan alberginera, which neatly tracks its culinary history. America calls it eggplant in deference to the form in which it is most often found, though it comes in a variety of shapes and colours ranging from white, green and yellow to the best-known deep purplish-black. Brinjals are at their best during the summer months. Choose those with tight, satiny skins; wrinklies are out. As a rule of thumb, the smaller the sweeter – though, from a practical point of view it’s a good idea to select a size and shape best suited to the recipe. Brush the lamb generously with olive oil and season with salt and pepper. 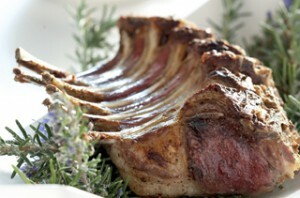 Pack a profusion of rosemary sprigs between the chops. Braai over hot coals until well browned and deliciously crusty. Raise the grid and cook over a more gentle heat until done to your liking – about 25 minutes if you enjoy meat that’s still tinged with pink. Turn the racks from time to time. Allow the meat to rest for about 10 minutes before slicing and serving. Roughly chop the coriander and mint. Stir in the yoghurt and season with salt and pepper. Scoop into a bowl. Cover and chill. Slice the brinjals into thickish rounds. Brush generously with olive oil. Heat a grill-pan and char-grill the brinjal slices for about two minutes on each side until tender and well marked. (You could also do this over the coals.) Transfer to a bowl, cover with clingfilm and set aside for about 15 minutes, then shred roughly with your fingers. Roughly chop the parsley and mint. Mix in the olive oil, vinegar, soy sauce and sesame oil, and season with salt and pepper. Pour over the brinjals and toss together. Tip into a serving bowl and garnish with rocket leaves. A medium-bodied Shiraz or Rhône-style blend with red fruit and perhaps a little whole-bunch fermentation stalkiness will complement the flavours of this dish superbly well. This recipe was originally developed by the late Lannice Snyman, one of South Africa’s most experienced and well-respected food personalities.